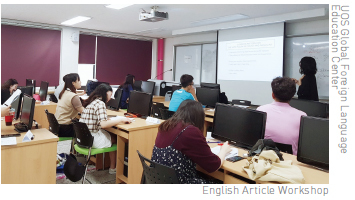 The University of Seoul (UOS) Global Foreign Language Education Center held English writing extracurricular program on summer vacation, which was entitled ‘English Article Workshop for Undergraduates’ on July 9 and 11. It was proceeded in two parts; part one is devoted to explaining overall concepts of English articles including the directions of article “A” or “The.” It took about three hours from 10 a.m. to 1 p.m. Part two was about giving idiomatic expressions and confusing examples of English articles, including general cases of using articles and the exceptions. For example, there is no article in front of a proper noun, but the paper, institution, building name, ocean, sea, river, desert, etc. are tolerant of putting the article before them. This part was also three hours long from 2 p.m. to 5 p.m., and took 10 minutes break every hour. Kang Jeong-in (Dept. of Science in Taxation, ’18), a student who was participated in this program, provided detailed information of the workshop and explained some contents of it. She said that the workshop was done in a way for imparting knowledge by a professor but different professors came each day. She also mentioned that it is really useful experience to learn the way of using articles for the students who think English articles are complicated. Besides English writing workshop, UOS provided various programs to students during vacation. Furthermore, these extracurricular programs can be recorded in your portfolio.